It can be a daunting process to search for siding contractors in the Orland Park, Illinois, area. If you choose Euro-Tech, however, you know you’ll be in good hands. We have been installing siding since 1992 and are proud to be the Midwest’s premier home improvement company. Our staff is friendly and knowledgeable, and will work with you every step of the way to help you achieve a beautiful new look for your home. First, we will come out to your home for a free consultation to discuss the preferences you have for your new siding, show you product samples, and teach you the features and benefits of our siding options. We then provide a complimentary estimate, leaving no surprises so you know exactly what to expect. Finally, with your agreement, our team of factory-trained and -certified technicians will properly install your siding in a timely manner. Energy efficient – All panels are insulated and reduce thermal conductivity. Quiet – It reduces exterior noise infiltration by up to 45 percent. Low maintenance – No painting or scraping will be required for years to come. Durable – It will never fade, crack, warp, or chalk. Best of all, our siding comes with a lifetime, non-prorated warranty that is fully transferable. 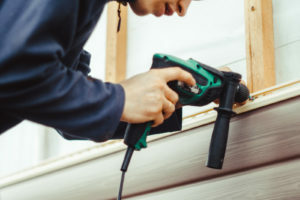 To find out more about why Euro-Tech should be your top choice among siding contractors serving the Orland Park, Illinois, area, and to receive a free estimate, contact us today.